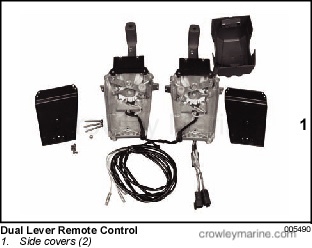 Use for “Evinrude® E-TEC®“binnacle mount remote control assemblies designed for Evinrude® and Johnson® outboards. 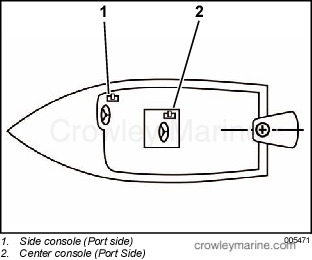 Use of fast idle feature is not required on Evinrude E-TEC outboards. 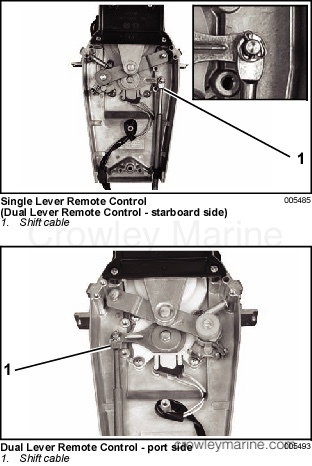 Refer to operator’s guide for specific outboard. The fast idle button can be used to advance throttle without shifting into gear. 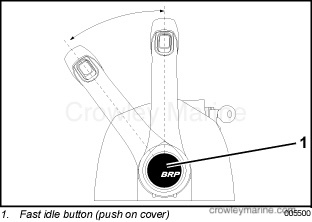 With control lever in NEUTRAL, push on fast idle button (cover) to open throttle for starting and warm-up. 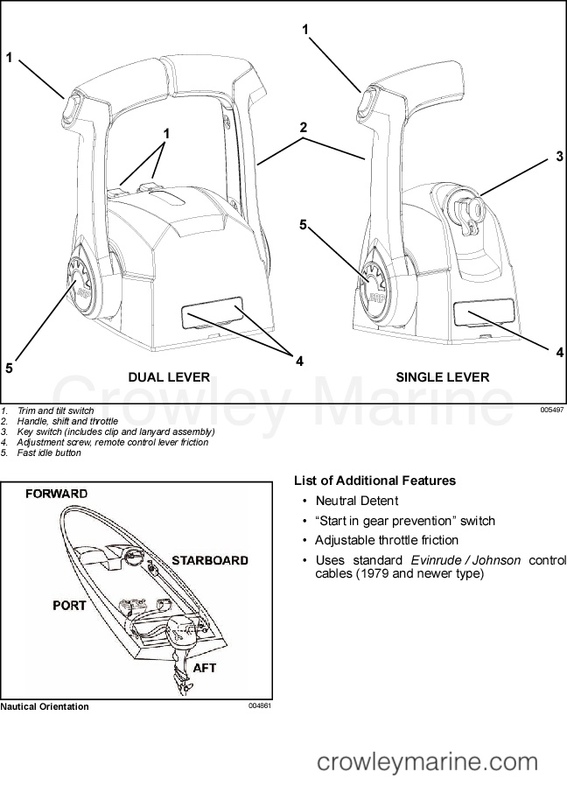 Refer to operator’s guide for specific starting instructions related to outboard. Turn key switch from OFF to ON position. The warning horn should sound momentarily to indicate it is working. Turn key to START position. Release key as soon as motor starts. 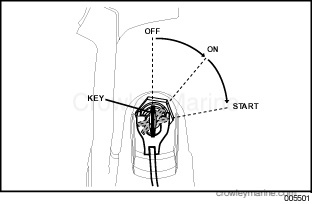 DO NOT turn key to START while outboard is running. 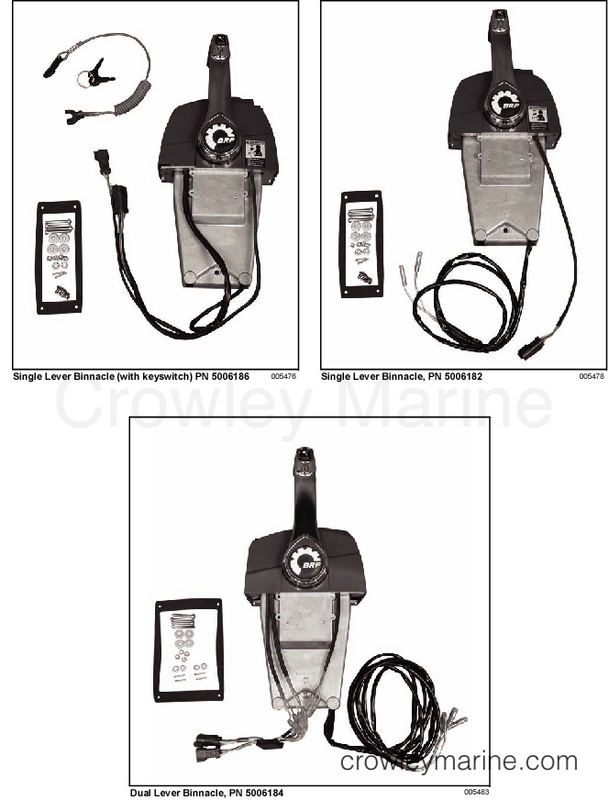 PRIME feature is NOT used on Evinrude E-TEC outboards. To use PRIME feature, momentarily push key IN with key in ON position. DO NOT run a cold engine any faster than necessary to keep it from stalling. DO NOT exceed 2500 RPM in NEUTRAL. 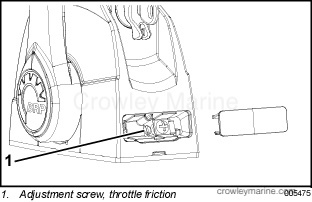 If throttle is advanced for starting, reduce idle speed setting as soon as outboard starts. For outboards with Quikstart™, wait until engine slows to IDLE RPM before shifting into gear. With control handle in NEUTRAL and fast idle feature not activated, move control handle to FORWARD gear or REVERSE gear position. Continue movement of control handle in same direction to open (advance) throttle. Move the control handle to FORWARD throttle range. Control handle should move freely. 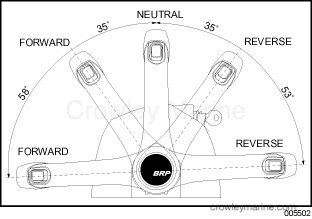 Adjust control handle friction adjustment to prevent vibration from changing throttle setting. 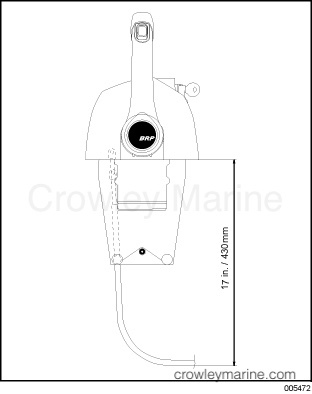 Use a flat head screwdriver to adjust control handle friction adjustment screw. 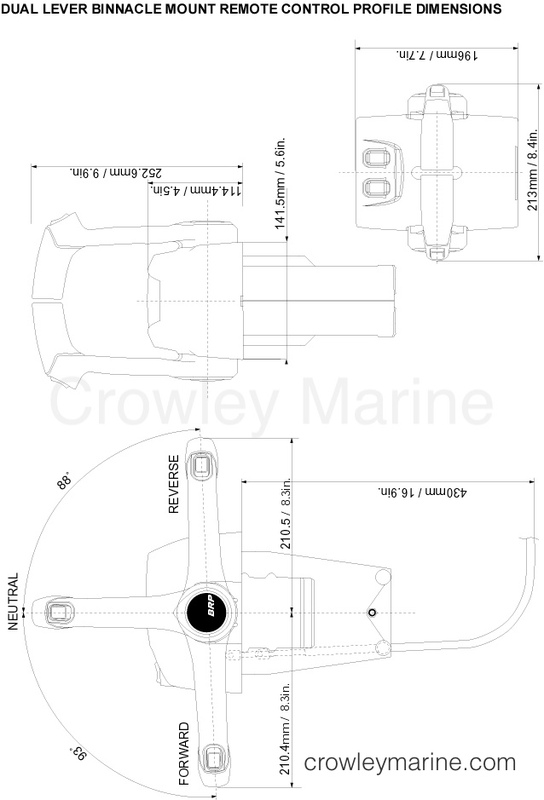 This adjustment is used to increase or reduce the force required to move the control handle. 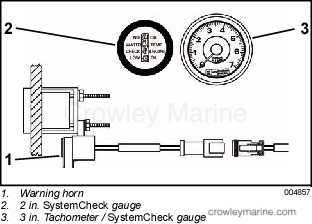 IMPORTANT: The warning horn must connect to wiring harness with a SystemCheck gauge or an audible horn driver module to be functional. 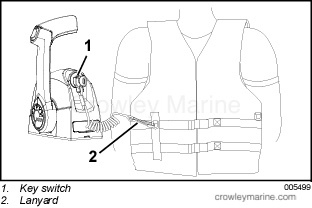 Refer to Operator’s Guide and instrumentation instructions for additional information related to the outboard’s warning system. 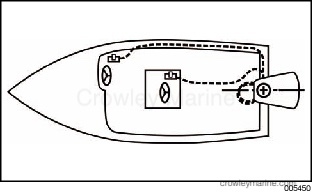 Select the appropriate location based on boat configuration. IMPORTANT: The mounting location must be a flat surface and must be strong enough to provide a rigid support. Strengthen mounting surface as necessary. 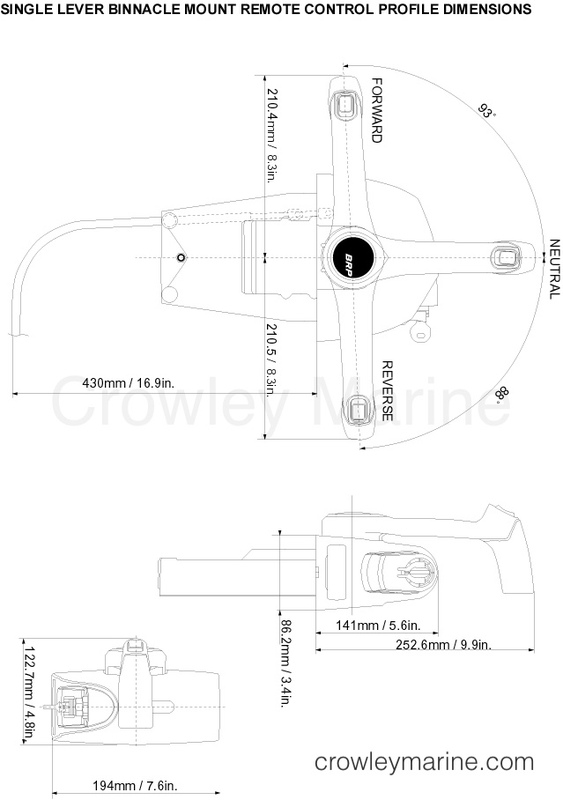 Refer to “SINGLE LEVER BINNACLE MOUNT REMOTE CONTROL PROFILE DIMENSIONS” on page 15 and “DUAL LEVER BINNACLE MOUNT REMOTE CONTROL PROFILE DIMENSIONS” on page 16. Place remote control at proposed location and check clearance around remote control handle at full throttle in FORWARD and then at full throttle in REVERSE. There must be at least 2.5 in. 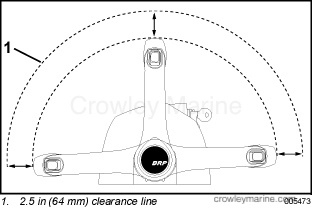 (64 mm) of clearance between the handle and any part of the boat throughout the control handle travel. There must be at least 17 in. (430 mm) of clear space below the remote control for cable routing. Control cables must be straight as they exit the remote control. Allow at least 6 in. (152 mm) to the beginning of the first bend of control cables. 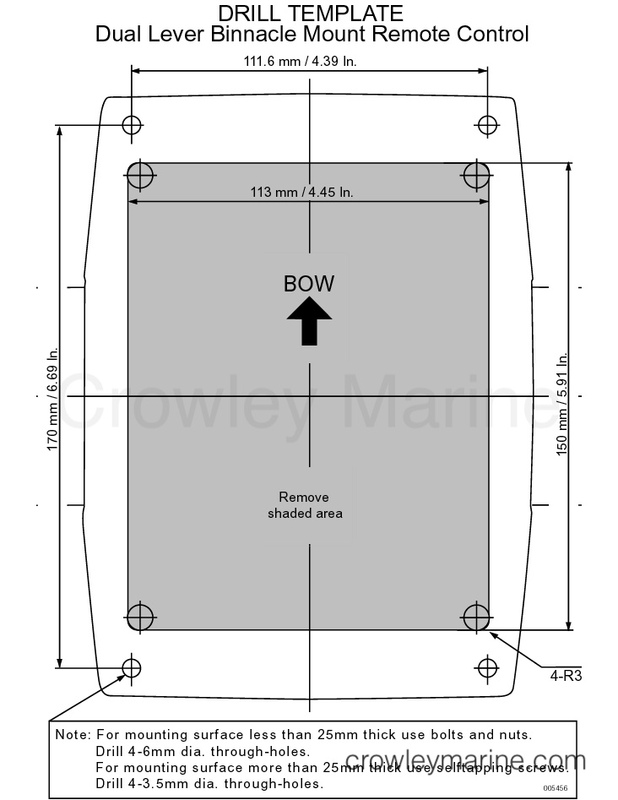 Refer to profile drawings and use appropriate drill template to cut mounting holes. IMPORTANT: Make sure the mounting location has all the required clearances before drilling or cutting. Disconnect battery to prevent accidental shock from electrical wiring. Position template. 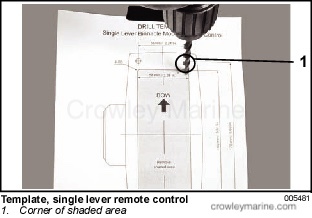 Use center punch and mark the centers of drill locations. Drill four (4) 3/8 in. 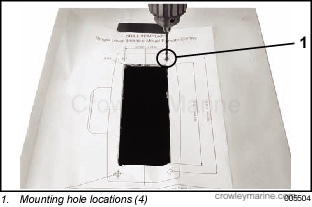 (9.5 mm) holes at the four corners of the area to be cut out. Cut along the lines of shaded area. Use reciprocating saw or appropriate cutting tools. Drill four 9/64 in (3.5 mm) holes at mounting hole locations. IMPORTANT: Route cables with fewest number of bends. Bends must never be less than 6 in. (150 mm) radius. Remove friction cover. 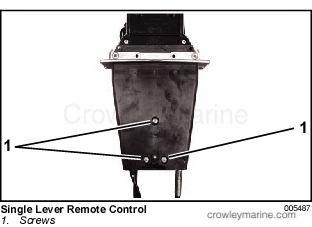 Remove cover retaining screw(s) and remote control cover. 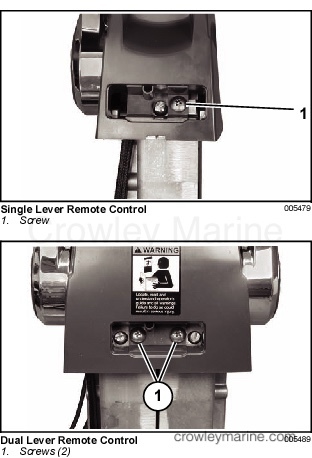 Single Lever Remote Control – Remove flange retainer screws and flange. 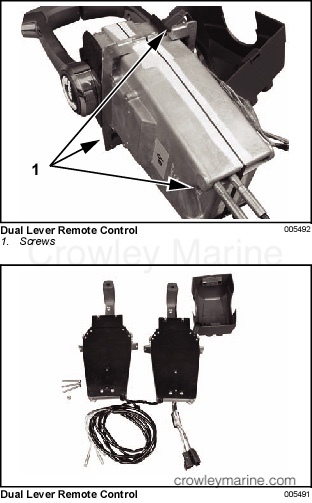 Dual Lever Remote Control – Remove three (3) screws and separate port and starboard remote control housings. 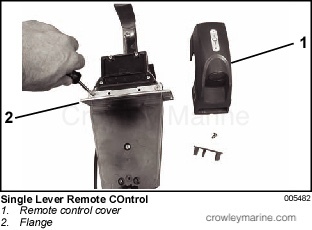 Remove screws and side cover from remote control housing. Always use new cotter pins and bend both sides of cotter pin as shown to prevent interference with remote control housing or possible dislodging of cotter pin from mounting pin. 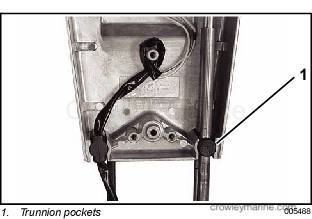 Make sure shift and throttle cables are in trunnion pocket(s), and safety switch wiring does not rub or interfere with movements of remote control components. 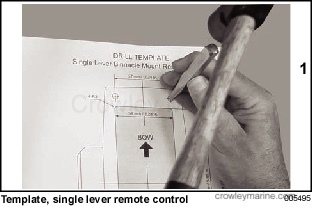 Single Lever Remote Control – Install cover and screws. 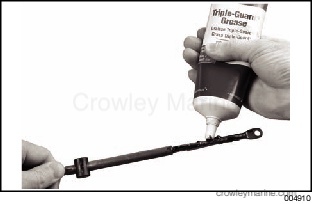 Apply Triple-Guard grease to assembly screws. Tighten screws securely. Check operation and movement of control levers. Make sure remote control shift and throttle functions operate smoothly. Refer to REMOTE CONTROL OPERATION TEST. 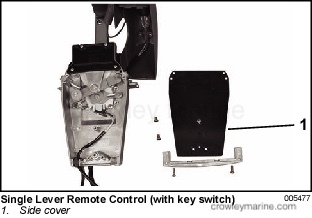 Dual Lever Remote Control – Install covers and screws. Apply Triple-Guard grease to screws. Tighten screws securely. Fasten control box in position with mounting screws provided. 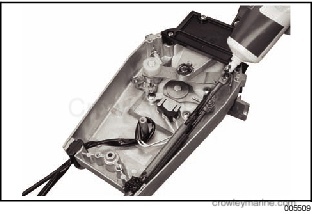 Install gasket and four screws. Tighten mounting screws. IMPORTANT: Make sure remote control assembly is secure and does not move during operation. 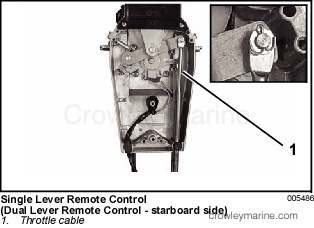 Refer to specific outboard installation instructions for information related to connecting remote controls to outboard. Connect neutral safety switch wiring. Connect trim and tilt switch wiring. Connect key switch wiring (if equipped). Operation Tests must be performed with outboard stopped. 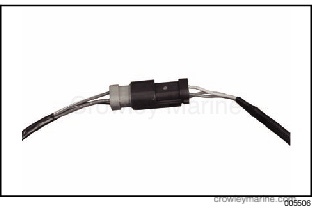 Disconnect emergency stop lanyard, disconnect battery cables, and remove spark plug wires from spark plugs and/or disconnect crankshaft position sensor (CPS) connector to prevent accidental starting of outboard. 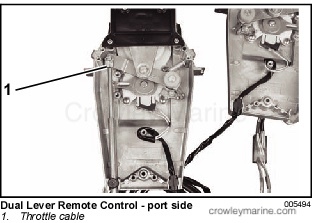 IMPORTANT: If remote control cables are connected to outboard, turn propeller shaft while shifting remote control. 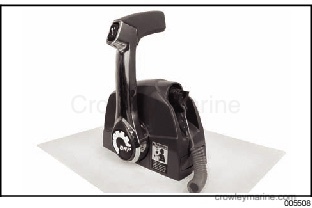 Shift control handle into FORWARD and advance throttle to FULL THROTTLE. Next, move handle back to IDLE position and then back into NEUTRAL. Notice detent function of remote control handle. Repeat process moving control handle into REVERSE. With the key switch in START position and the starter cranking the engine move control handle to FORWARD. The starter should stop as handle leaves NEUTRAL. With key switch in START position and the starter cranking the engine move control handle to REVERSE. The starter should stop as handle leaves NEUTRAL. Check throttle friction. 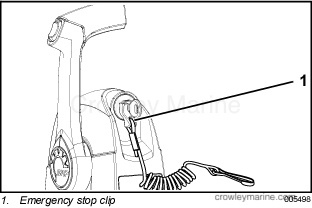 When properly adjusted, control lever should have low friction to allow easy movement in FORWARD throttle range, and not allow vibration to change throttle setting. 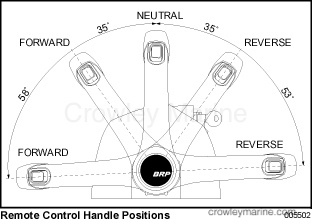 Refer to Control Handle Friction Adjustment. 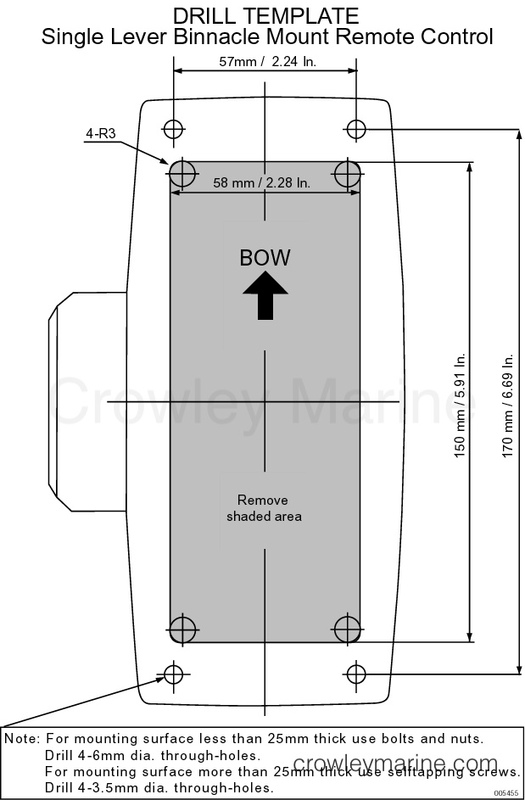 Secure boat to dock to prevent motion. Attach lanyard to key switch. Place control handle in NEUTRAL position. If needed use fast idle feature. Turn key ON. (Warning horn should sound momentarily as self-test on SystemCheck equipped installations.) Turn key to START. Release key as soon as outboard starts. (Push in on key for enrichment function if outboard is equipped.) 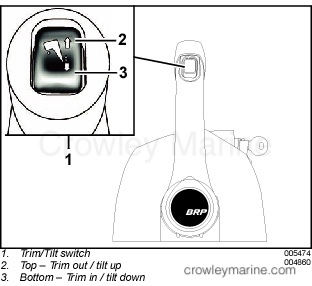 Do not turn key to START while outboard is running. 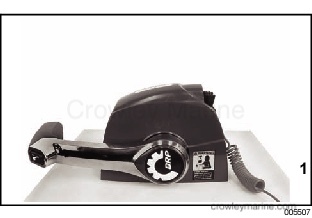 Refer to outboard’s operator’s guide. Check shift operation. Check that outboard shifts to FORWARD when control is shifted to FORWARD, and shifts to REVERSE when control is shifted to REVERSE. Check that remote control operates freely and equal friction is felt in FORWARD and REVERSE throttle range of control handle. 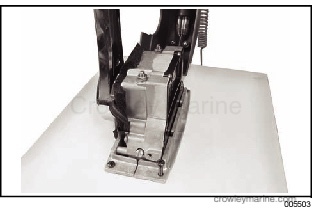 Inspection and maintenance must be performed with outboard stopped. 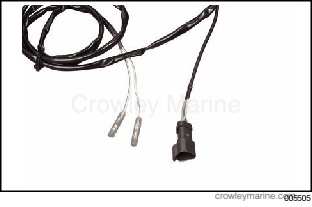 Disconnect emergency stop lanyard, disconnect battery cables, and remove spark plug wires from spark plugs and/or disconnect crankshaft position sensor (CPS) connector to prevent accidental starting of outboard.